In the 17th century Japanese shoguns closed Japan for the foreigners and all aliens were expelled from the country. The country was totally isolated. Only Dutch could have a commercial station in Nagasaki. Meanwhile, Americans who traveled in Pacific area always had a shortage of coaling and needed protection from storms for their ships, seeking for new commercial expansions including Japanese land. In 1853 Commodore Matthew Perry opened “The Land of the Rising Sun” to the world trade. He had a task from US President Millard Filmore, who ordered him to negotiate with this country, using troops only in case of emergency. Black and impressive fleet of Commodore of the USA made his way to Japan. The fleet kept the direction to the Tokyo’s south side. The city was struck with panic, when the heavy smoke came into the picture. Of course, the reason was the coal-burning ships, but people thought that something was on fire. The Commodore’s Squadron had store ships, huge steam frigates, several sloops-of-war and impressive corvette. Perry felt proud for his fleet, because he by himself took part in development of naval steamboats. But flagship Susquehanna was Perry’s the best ship in fleet. Regardless of residences’ confusion, open dialog between two sides met with success. In 1968 the wide got acquaintance with Japanese tattooing. Ironically, this year the new Imperial Japanese government allowed the tattooists to work only on foreigners and banned locals to use their services. And this law had a great impact on the European and American tattooing. Ex-sailors, like George Burchett, got Japanese tattoos during their visits with British Navy and brought great accounts. Lately Hory Chyo of Yokohama – great master of tattoo craft – had clients like the future English King George V and Russian Czar Nicholas II. Till nowadays a lot of people tattoo traditional Japanese images, which in some way became classic. It always looks stylish and fashionable. 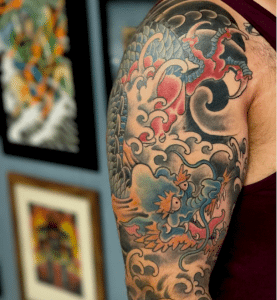 Many tattooists admit that, delighted with the beauty of eastern tattoo art. George Burchett states, that only Oriental with his perseverance, devotion, religiousness, could create a tattoo which was so close to perfection. Burchett knew many gifted and really talented Western tattooists. But he claimed that they were shadows of the real Japanese art, which had been cultivated for more than two thousand years.